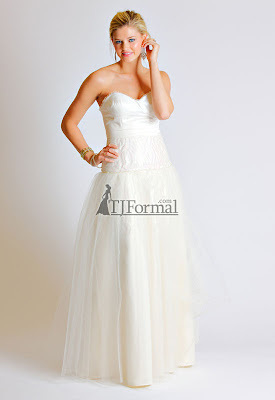 TJ Formal Dress Blog: Oscar-inspired gowns from Faviana! Faviana is well-known for making celebrity-inspired dresses. This time they took a look at the gowns worn at the Oscars on March 7 and chose 4 dresses from the stars to make available to all of us! First up is a gown inspired by the one worn by Maggie Gyllenhaal. Faviana 2010 Prom Dress 6605 is a strapless, printed chiffon gown. Faviana 2010 Prom Dress 6606 was inspired by Miley Cyrus' dress with a corset bodice and full skirt. As mentioned in a prior post, Kristen Stewart walked the carpet in a dark navy strapless ball gown. Faviana 2010 Prom Dress 6604 mimics Kristen's dress. And last, but not least! Queen Latifah's dress inspried this gorgeous pink gown Faviana 2010 Prom Dress 9244.